I guess I will begin by recapping my recent explorations of Salzburg. Last weekend we had some really terrific weather, so Gerhard and I went for a nice long bike ride in the morning, which was great fun and very refreshing. I learned the best bike route into the city along all the little streams and rivers, so now Gerhard and Margot let me use their son's old bike to ride to school when the weather's nice. This is a great way to start the day, if one disregards the bicycle seat from hell (I swear it's a torture device left over from the Spanish Inquisition). The afternoon was then spent climbing the Mönchsberg, one of the city hills (nearly a mountain by Maine standards) and the one that lies behind the school. On top, it hosts some of the oldest ruins in Salzburg; the remnants of the medieval defences and a monestary, not to mention the Schloss, a five star hotel, and a modern art museum. The views of the city were great, and it was a lovely break from homework! I didn't get into the art museum that day, so I will have to go back. Later on, we will visit the castle with school, so more on that when we make the field trip. On Tuesday, Pheobe from school took us out to Hellbrunn, the former residence of one of Salzburg's archbishops. This is no ordinary mansion and garden! Perhaps it is better described by the Austrian nickname for it: "Wasserspiele" (playful waters), because throughout the gardens are the most incredible fountains! They are integrated into a series of grottos, seats, and paths throughout the lawn, and you never know when you might get squirted. There is even a theater of miniature figures in a medieval town setting that move and a kalliope plays-all powered by water! 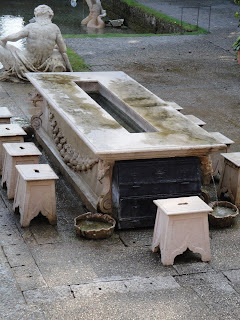 The archbishop at the time thought the best way to entertain himself through a dull court dinner or visit was at the expense of his guests, because all the fountains along the way are booby-traps to surprise the unsuspecting courtier (now-a-days tourists). At a table beside the outdoor theater, water will shoot out from all the stone seats (except the one at the head of the table-that was reserved for the archbishop himself, and therefore dry!). During dinner, he would signal for the water to be turned on, leaving his poor guests soaking wet in their best clothes, and they of course could not get up from the table before the archbishop due to etiquette. I don't suspect that many wanted to return for a second visit! The grounds were quite beautiful and entertaining, and we also got a look into the residence itself, and a small museum of folk art on the nearby hill. Most of it is rather like a public park, with gardens, a cafe and many walking paths. At the base of the hill, there is a really cool natural ampitheater, where one of the earliest operas was performed first. It was a very entertaining afternoon, and I only got wet once!